Baisvik Disk Cleaner is the best solution for computer disk cleanup from unnecessary files. In addition to the fact that such files occupy considerable disk space they can also represent threat to safety of your computer. Temporary files that are created by various programs can tell much about the user and thus represent threat to his/her safety. This is why the utility for system cleanup should by all means be installed on each computer that is actively used for work and which is used for access to the Internet. 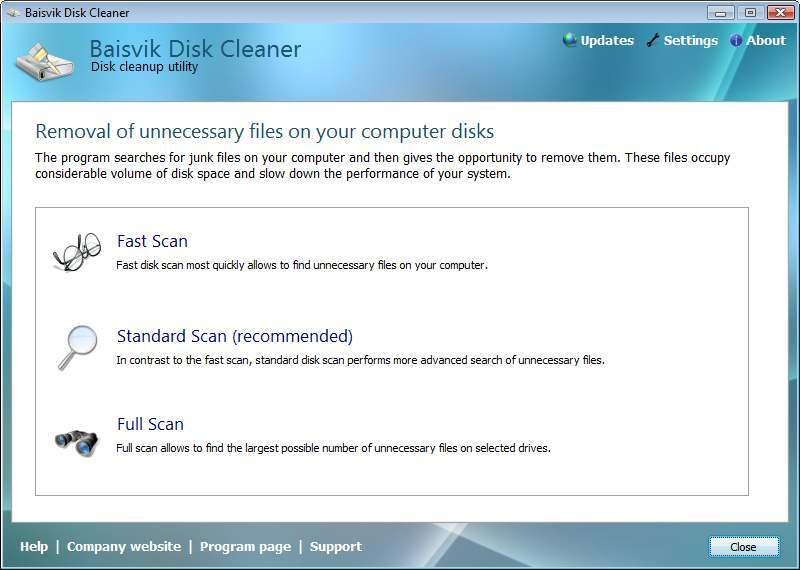 Baisvik Disk Cleaner has intuitively clear user interface that makes it simple in use. Even inexperienced user can without any problems clean computer disks without attraction of an expert. Baisvik Disk Cleaner is equipped with 17 special categories that allow to clean cache of practically any popular browser, various system and user temporary folders, history of program launches, information on files previously opened, recycle bin and many other things. The program has 3 modes of check of disks on availability of useless files - "Fast Scan", "Standard Scan" and "Full Scan". Using "Fast Scan" mode you will find quite considerable number of unnecessary files within the shortest time interval. In addition, by means of "Full Scan" function it is possible to perform full scan of all hard disks on availability of useless files. For this purpose Baisvik Disk Cleaner has over 20 built-in categories with templates for search of unnecessary files. After disk check the program gives you a chance to choose files that need to be removed. This site does not contain serial number, crack, keygen Baisvik Disk Cleaner serial number : serial number is the simplest type of crack. A serial number(cdkey,product key,etc) is register the program as you may already know. a crack or keygen may contain harmful software. If you cannot find the exact version you want, just give it a try. for more information read .nfo/.txt/.diz file include in zipped file.